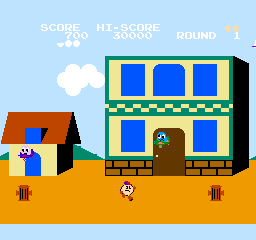 Pac-Land was released in the arcades in 1984 and marked a significant departure for the series. This home console port came out a year later but only in Japan for the Famicom. Instead of eating power pills in static maze levels this game is a side-scrolling platformer where your objective is to carry a fairy to Fairyland and then return back to your home. Your journey is split up into four different trips that consist of four stages each. The first part of each trip involves simple left-to-right stages where you have to dodge one-hit kills by ghosts and avoid a number of traps. Near the end of each stage you'll find a yellow pellet - if you eat it you'll be temporarily invincible and earn extra points for gobbling up any ghosts on screen. The second part takes place once you reach Fairyland as you're granted with magic boots that give you the ability of infinite jumping without needing to touch the ground. These stages are reversed (right-to-left) and they're by far the hardest to complete due to the amount of enemies in your way. Each trip is quite a challenge, mainly due to the unintuitive controls where you press the A button to go right and B to go left. Continually pressing either button will build up speed allowing you to jump further which you perform by tapping any direction on the d-pad. Enemies frequently appear from nowhere and the control scheme doesn't quite have the precision to allow you to make quick second changes. As a result you'll lose many lives by accidentally hitting ghosts or by falling off the edge of a platform that you're trying to slowly manoeuvre on. The more you play through the game though you will start to grow accustomed to the controls and get into a rhythm of when, and how often, to hit each button. At this point you'll have much more fun and be able to whizz through the short stages with greater ease. While the stages aren't the most imaginative, each one has different obstacles and gameplay challenges to keep things fresh. The game can become quite repetitive but fortunately it doesn't outstay its welcome with only 16 stages that loop once you've finished them all. You will notice the odd bit of slowdown but there's nothing here that's game breaking. The graphics are cute and extremely colourful but like most early NES / Famicom titles they lack any real detail or texture mapping. Minimal effort has been put into the music and SFX; there are only two tracks in the whole game and one of them is a slightly remixed version of the first one! Pac-Land is a nice break from the traditional Pac-Man games while reusing a number of familiar elements from the series. It does takes a while to get comfortable with the obscure control scheme but stick with it and you'll find a fun, albeit limited, platform game. Random trivia: Despite never being available on the NES in Europe and North America, Pac-Land was eventually released worldwide on the Wii U Virtual Console in 2014 to celebrate the mascots' appearance in Super Smash Bros.